HBO's Westworld premiered in 2016. Based on 1973's film by the same name, the series became very popular for the network, and with a star-filled cast, as well as a surprisingly timely plot, it's not hard to see why. In a time where we are constantly connected to the world around us and are given the instant gratification that the internet now provides us, Westworld stands out as "the ultimate" in this connected arena. Run by Dr. Robert Ford (Anthony Hopkins; Thor: Ragnarok) and Bernard Lowe (Jeffrey Wright; The Hunger Games), Westworld provides its guests the opportunity to make all of their wild west fantasies come true. The theme park contains ultra-realistic animatronics ready to cater to your every whim. However, their artificial intelligence is underestimated, as the animatronics begin to rise up after feeling that they aren't being treated fairly. The stellar cast of the second season also includes the return of Ed Harris (The Abyss) as the Man in Black/William, Evan Rachel Wood (True Blood) as Dolores Abernathy, and Thandie Newton (Solo: A Star Wars Story) as Maeve Millay. As stated before, Season Two: The Door brings the inevitable rise of the animatronics. After being programmed so intelligently and realizing that they are used and abused simply to please humans, we see them banding together and ready to battle humans. We also see some backstory into the theme park as well as a new land, Samurai World. This fascinating turn of events leads to chaos and left the viewers wanting more. Season two was just as visually stunning as the first when it was shown on television. The 4k UHD version brings the visuals of Westworld to a new level. Featuring Dolby Vision as well as HDR the color literally "pops" off the screen. The Dolby Atmos mix, which was specifically remixed for home theaters, makes the aural world of Westworld and Samurai World envelope you from all sides. The disc is simply a total emersion into Westworld without actually going there. The Truth Behind Delos - A discussion about Delos' motives behind the theme park. These Violent Delights Have Violent Ends - a discussion about the use of violence in the season. Bring Yourself Back Online: Reflections of Season 2 - Leonardo Nam, Ptolemy Slocum, Jeffrey Wright, Evan Rachel Wood, and James Marsden discuss favorite moments throughout the season. Bring Yourself Back Online: Of Love and Shogun - Leonardo Nam and Ptolemy Slocum host a discussion with Thandie Newton, Simon Quarterman and Rodrigo Santoro about the love lives of their characters. Bring Yourself Back Online: Journeys and Technology - A discussion about how this season relates to our real world, featuring Luke Hemsworth, Ben Barnes, Angela Sarafyan, Leonardo Nam and Ptolemy Slocum. Creating Westworld's Reality: The Drone Hosts - A behind the scenes look at the Drone Hosts. Creating Westworld's Reality: An Evocative Location - A look at the Delos mansion. Creating Westworld's Reality: Fort Forlorn Hope - A look at the creation of Fort Forlorn Hope with Lisa Joy and Jonathan Nolan. Creating Westworld's Reality: The Delos Experiment - A behind the scenes look at The Riddle of the Sphinx episode. Creating Westworld's Reality: Shogun World - Cast and crew talk about this series' new world. Creating Westworld's Reality: Inside the Cradle - A discussion about the technology behind The cradle with Jonathan Nolan and Jeffrey Wright. Creating Westworld's Reality: Chaos in the Mesa - A look at some of the Westworld shootouts. Creating Westworld's Reality: Ghost Nation - A discussion about the Kiksuya episode with Executive Producer Lisa Joy and actors Zahn McClarnon and Martin Sensmeier. Creating Westworld's Reality: Deconstructing Maeve - A behind the scenes look at the makeup done on Thandie Newton for the last few episodes of the season. Creating Westworld's Reality: The Valley Beyond - A discussion with the cast and crew about the finale. The Buzz: On the Red Carpet - This Vudu digital extra features the cast and crew on the red carpet for the Hollywood premiere of the second season. Return to Westworld - This Vudu digital extra features the cast and crew discussing their return for another season. Digital Copy - The full season available from Vudu via a digital code. While Westword Season two was not at the same groundbreaking level the first season was (fairly, few are), it still is one of the best series on television. The only bad thing is because of all the attention to detail, as well as the scope of each episode, we will probably have to wait till 2020 for the next season. At least, until then, we have a top-notch Season two in 4K to help us endure. 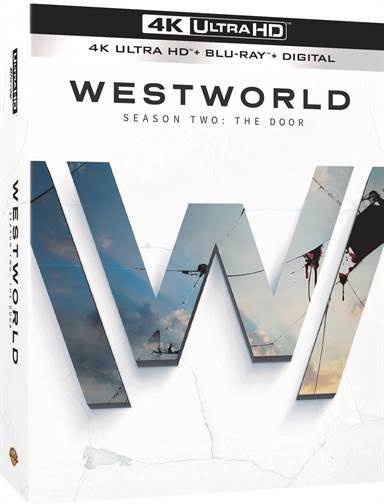 Download Westworld Season Two: The Door from the iTunes Store in Digial HD. For more information about Westworld visit the FlickDirect Movie Database.